Altona Mower Service is a family-run business located at 90-92 Millers Road, Altona North. The store has been providing the area with a variety of power tools since the early 1970’s. Many of our customers have been shopping with us for over a decade and continue to return due to our friendly and reliable service. Following multiple renovations, Altona Mower Service has now doubled in size, ensuring that all your outdoor lawn care needs are met. We stock a large range of products including lawnmowers, chainsaws, brush cutters, blowers, cleaning products such as heavy-duty vacuum cleaners and much more. We specialise in Stihl equipment, including a large variety of battery-operated products. We also offer products by Honda, Victa, and Masport. The owner and manager of Altona Mower Service, Greg, works alongside many of his family members in store including his wife, son, daughters and sister-in-law. We offer first-class services and repairs, undertaken by our highly trained and qualified mechanics. The team at Altona Mower Service is committed to excellence in sales and service. We are courteous, helpful and have great knowledge of the garden equipment industry. When purchasing one of our power tools, a member from our sales team will assemble the product for you and provide a comprehensive run down on the products operation, including safety tips. Follow Altona Mower Service on Facebook and Instagram to stay up-to-date with all the latest specials and gardening tips and tricks. 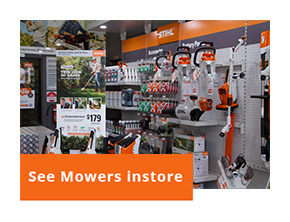 With a great range of products in-store and online, you will be sure to find what you are looking for to suit your gardening needs at Altona Mower Service. © Copyright 2018 Altona Mower Service. All Rights Reserved.